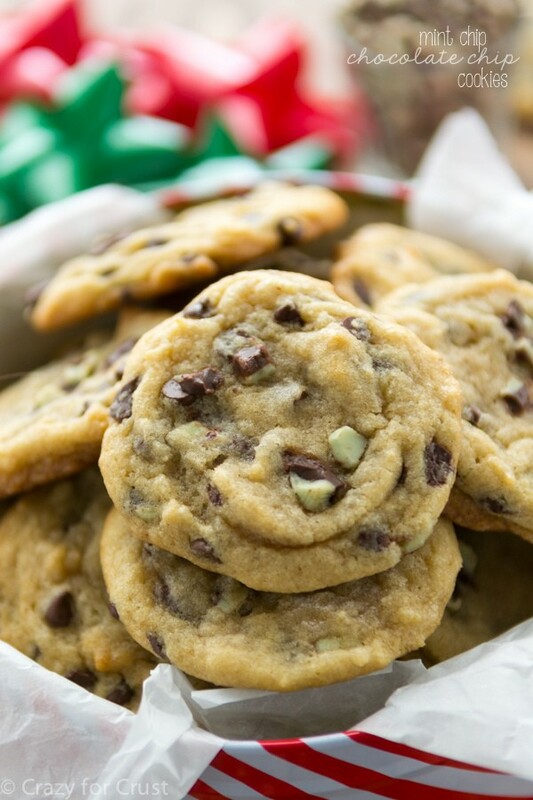 These Mint Chip Chocolate Chip Cookies combine my two loves: mint chips and my favorite chocolate chip cookie recipe! Can I sneak in one more mint chip recipe before Christmas? Because this one? You totally need. I am so feeling the rush to Christmas. Is it just me? All of a sudden the big day is going to be here in less than two weeks and I’m still not done shopping, wrapping, or baking. And then, you food bloggers understand this, I’m trying to get ahead for January. In the midst of making fudge and candy and Mint Chip Chocolate Chip Cookies, I’m testing healthy muffins and brownies so I’ll have posts after Christmas. I’m really hoping to take a lot of the two week Christmas break off…which means all my work needs to get done ahead of time. I need a clone. Is there somewhere I can go buy one? Maybe the Neiman Marcus catalogue? Oh well, it would probably be too expensive anyway. Rich people get all the fun things. If you’re feeling as crazed as I am because you need cookies for teachers, for neighbors, and for your family too, then look no further. 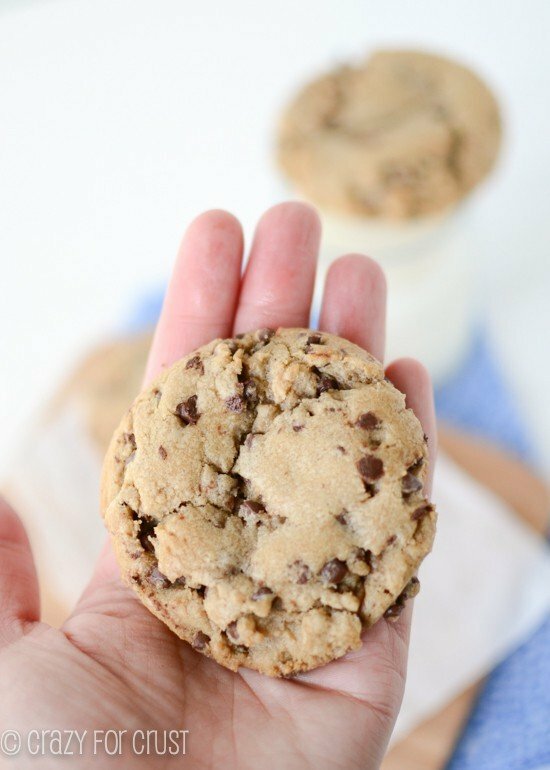 This Mint Chip Chocolate Chip Cookies recipe right here is perfect for when you need lots of cookies: it makes 4 dozen! 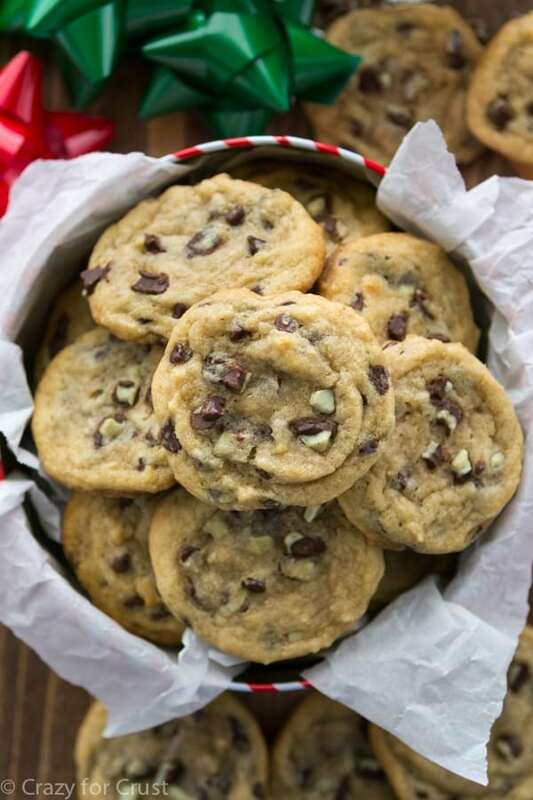 Oh, and not only that, but it’s my absolute favorite chocolate chip cookie recipe. I’ve used this same base to make Kit Kat Cookies, Rolo Cookie Cups, Chocolate Chip Cookie Mud Hen Bars, Oreo Truffle Chocolate Chip Cookie Bars…should I go on? Pretty much you get this is my favorite, right? The recipe is so good because it starts with melted butter (sometimes I brown it first) and a healthy does of brown sugar. Making the dough with hot melted butter and brown sugar gives the cookies a slight toffee flavor. That’s why I love using melted butter so much! Because the butter is melted when you make the dough, you must chill these cookies. How long? The longer the better. When I first started making this dough I would chill the whole bowl overnight and then get a really good arm workout the next day scooping the cookie dough balls. Then I got smart and started scooping out my balls of cookie dough and chilling them on a cookie sheet. It’s much easier to scoop the dough when it’s soft! Chilling balls instead of a bowl can also cut the chill time, but you need to let them chill at least 4 hours (but overnight is better). Chilling the cookies overnight not only ensures you’ll get a soft cookie inside with a chewy outside, but it also helps develop the flavor of the cookie. Do not skip the chilling! And lastly, in a chocolate chip cookie, there must be chocolate chips. I like to use mini chocolate chips because it seems to disperse the chocolate flavor through the dough more than large chips do. You can get mini chocolate chips at most grocery stores. Nestle and Guittard both make them. For these Mint Chip Chocolate Chip CookiesI added Mint Chips because, well. Christmas and all that. Mint chips in chocolate chips cookies are really thebombdotcom. I used the green package of Andes Mint Baking Chips they sell in the baking aisle. I’ve seen those chips all year long at my stores, but if you can’t find them get the boxes of Andes Mints and chop them up. It’ll work just as well. 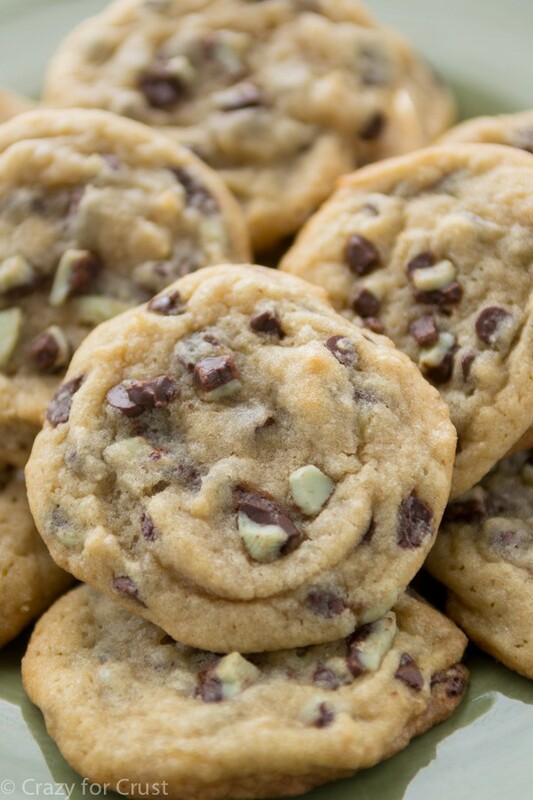 Depending on how big you make them, these Mint Chip Chocolate Chip Cookies make upwards of 4 dozen. That’s perfect when you have a lot of people on your gift list, or if you’re attending a cookie exchange. I’ve never actually been to a real cookie exchange, but I’ve done a virtual one four times now. These cookies were once again part of The Great Food Blogger Cookie Swap, hosted by Love and Olive Oil and The Little Kitchen. It’s a fun thing to be a part of, the swap, because it introduces you to new blogs you may not have seen before. This year, these cookies went to The Seaside Baker, Food and Life Beautiful, and Sugar Dish Me (who I totally know and was excited to get matched with!) I hope y’all enjoyed your cookies! I received cookies from Mimi Avocado (who sent delish chocolate cinnamon cookies) and The Daily Dabble (whose peppermint crunch cookies were so addictive I ate almost the whole box). I love getting cookies in the mail. Makes for a #happymailday! Okay, I better go now. It’s finally sunny outside which means I need to photograph allthethings before it rains again. Food bloggers, you get me right? 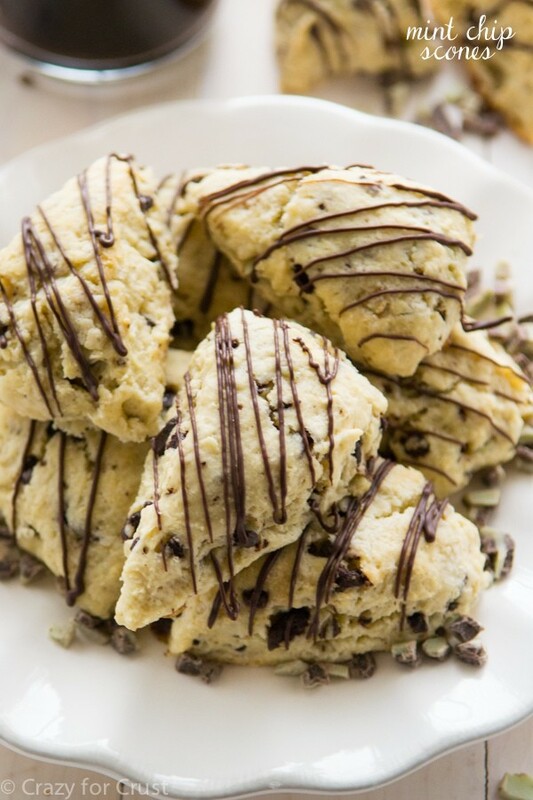 My favorite chocolate chip cookie dough made with mini chocolate chips and MINT chips! 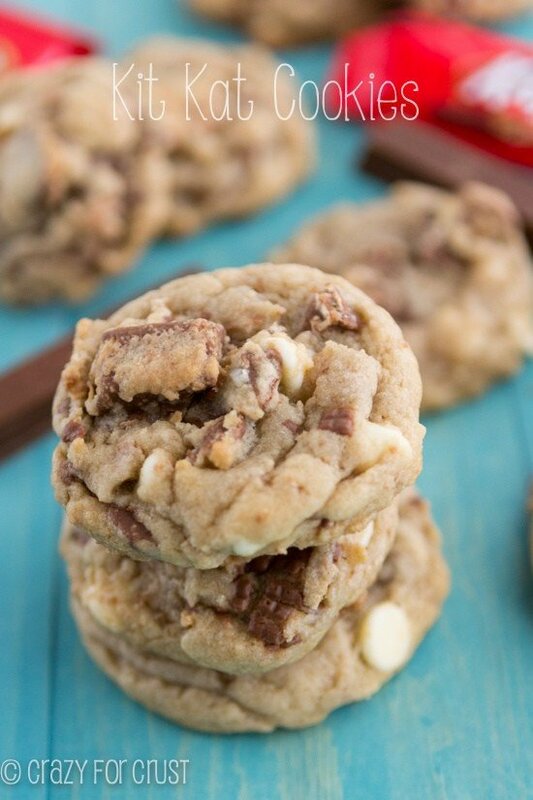 The perfect cookie for holiday cookie exchanges - it makes 4 dozen! Pour butter into an electric mixer fitted with paddle attachment. While still hot, add both sugars and mix on low until combined. Let sit to cool for a few minutes. Turn mixer (with butter mixture bowl attached) on low. Add eggs, one at a time, mixing completely. Mix in vanilla extract. Add flour mixture to the wet ingredients and mix until combined. Stir in chocolate chips and mint chip pieces. Scoop one tablespoon (or two tablespoon) balls of dough and place close together on a cookie sheet lined with parchment paper or a silpat baking mat. (If the dough is too soft to scoop, you can chill it for 30 minutes first.) 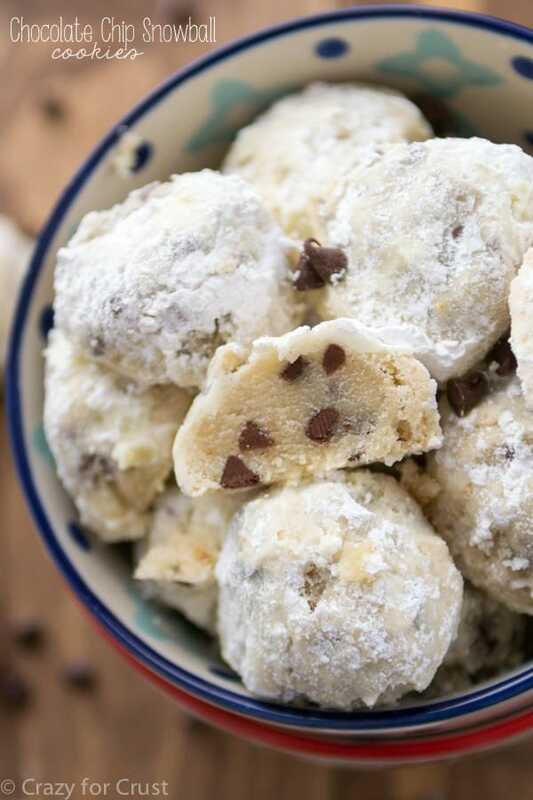 Cover the cookie dough balls with plastic wrap and chill overnight. Preheat oven to 350°F. Line cookie sheets with parchment or silpat liners. Place cold cookie dough balls 2 inches apart. Bake for about 10-12 minutes. They will be golden on the outside and still doughy on the inside. I like my cookies a little underdone, so I bake them for 10 minutes, but if you like a more done cookie, do 12 minutes. Let cool for 5 minutes, and then remove from pans to cool completely. 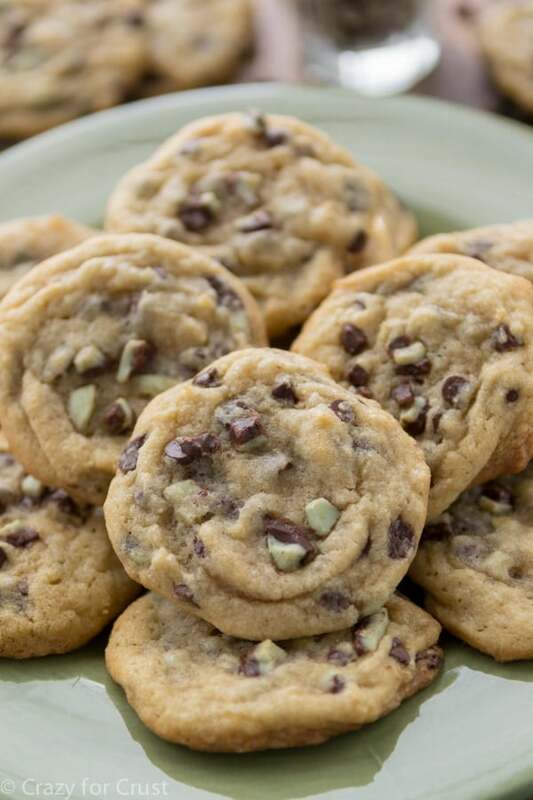 If you loved these Mint Chip Chocolate Chip Cookies you’ll also love these! Ohmygosh YES. I need a clone too! Starting Friday, I’m doing January’s recipes (oh goodness), and although I have gift IDEAS, I haven’t actually bought or wrapped anything yet. I’m the worst. But I think we should have mint + chocolate cookies all year round! Hi. Can this dough be frozen for later use? Yes, it can. Or you can freeze the cookies once they are baked! That’s wonderful! Is there any difference as to the outcome (texture, taste) between freezing then baking and baking then freezing then re-warming (follow-up, how do you re-warm them?)? Which do you prefer? I made the dough this morning with the “help” of my almost three-year-old daughter. Can’t wait to see how they come out. We chilled 63 cookie doughs! Used 2-inch cookie scoop. I don’t normally freeze dough, I just bake all the cookies, then freeze them between layers of paper towels in gallon size ziploc bags. (This post details that process: https://www.crazyforcrust.com/2014/10/freeze-desserts/). Let them come to room temperature with the paper towels still there to absorb moisture and you won’t even know they were frozen. If you freeze the dough balls, just place them in a ziploc or airtight container. Let them defrost in the refrigerator (probably a few hours to overnight) and bake as many as you want as you want them according to the baking instructions. Hello, Ii just wanted to ask if these cookies were suppose to be very gooey almost in the middle not like regular 1/2 soft and half hard cookies? I usually bake mine more gooey, yes. Because they are cold going into the oven, the cookie stays a little more under-done in the center and cooks more on the outside. That’s how we prefer our cookies. If you like them more done, you can flatten them slightly with your hand before putting them in the oven, which will make them bake more evenly, or you can bake them longer. I’m having a lot of trouble with this recipe. I’ve tried it twice now, but the cookies keep coming out fluffy as if I have over mixed them. I know this sis not the case because I’m hand mixing with a rubber spatula so I can monitor how much it is mixed. I followed the ingredients verbatim. Do you know why this could be happeneing? I LOVE this recipe! I have made them several times this year for the holiday and they are great! I do not recommend freezing the balls as Ive found they made them puffy, but keep them in the fridge as long as you need and they come out perfect! Thanks so much! I have had so many compliments on these! Much better than the recipe on the back of the andes bag!